Miss Snark, the literary agent: You look good on paper...how do you sound? 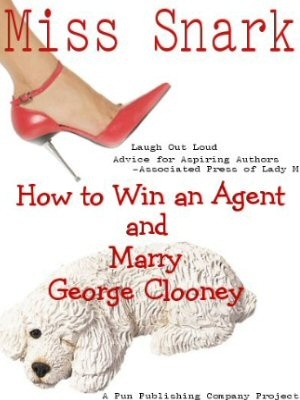 Hi Miss Snark, As a nonfiction writer, I've had a few agents over the years. Before agreeing to represent me, each of them wanted to either meet with me in person or, if we were geographically separated, have a long phone conversation with me. I assume their aim was to assess my personality and other relevanrt characteristics so they could transmit this information to publishers. If my assumption is correct and if you engage in this practice, what qualities do you look for in a potential client other than writing talent? well, I want to avoid the raging nitwits. And the whack jobs. And the people who make me consider re-joining the Sisters Of Perpetual Partying over on Convent Ave. I want to make sure you don't sound like Elmer Fudd. I want to make sure you can carry on a conversation. I want to make sure you're alive. I want a chance for odd information to surface: you're a member of the Nazi party; you think Bill O'Reilly is too liberal to really know the depths of the left wing conspiracy; you think John Kerry is too conservative to truly understand the depths of the right wing conspiracy; you know you "have to" have an agent but really they're worthless and you hope you don't need one for long. I listen for how intransigent you are about editing; how responsive you are to things I need. I listen for how you talk about your wife. I ask about your last agent. And if you're smart, you're doing the exact same thing. Amen! I snagged my book deal because I give great phone. I convinced my agent and the editor who was presenting my book to the acquisitions committee to push for a conference call so I could pitch to them. I'm a talker and since no one knows my subject or believes in my book more than I, who better to convince them? A pretty atypical approach, but it worked for me. Now, that's something I didn't know about - being called, I mean. Interesting information. Do you use the call to determine how well you'll get along personality wise as well? I would assume so, but I suppose you can still represent someone you can't be too friendly with as long as they are willing to work with you on a professional level. Maybe? On the other hand, I hate talking on the phone. I absolutely detest it. I'm fine in person talking about my work, but not on phone. Miss Snark, am I in trouble? "Hi, this is agent so-and-so calling...."
Followed by sound of falling body. Is this familar, Miss Snark? I've had people cry when I call them too. It's a trifle disconserting, but rather sweet. Gee, if I sounded like Elmer Fudd, I'd think I'd be able to cash in like Mel Blanc. My Senator, Joe Lieberman, certainly does and did. And if sounding weird is a disqualification, how successful would Truman Capote have been? Sounding really weird can be a distinctive plus. Thank you for this bit of insight. I admit, having not subbed to any agents (but getting ready to), I hadn't heard of this yet. Jen, I wouldn't worry about. This is not how everyone operates and it's not necessarily a dealbreaker. The first time I spoke to my agent on the phone was to tell her that I accepted the publisher's offer. Well, I didn't cry. I will say I had to catch my breath a few times. Once I could think again, the conversation went just fine. But that's only because my agent is such a sweetheart, so it's easy to feel at ease with her. As for the Elmer Fudd stuff ... Um ... yeah. I do see how that could be a problem. What's wrong with sounding wike Elmer Fudd? He's a human being. If you pwick him, does he not bweed?